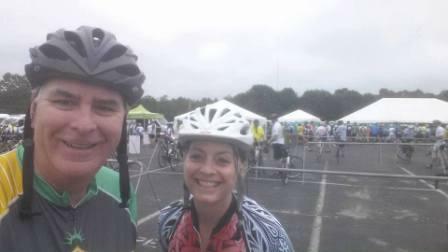 A team of Winslow Animal Hospital veterinarians has participated in the MS City to Shore Bike Ride annually for the past several years. The event is a fund raiser to support research on the disease Multiple Sclerosis. This year, Dr. Philippe Coudrai, Dr. Amy Hinze, and Dr. Jen Chachkes committed to serve the community by taking part in the event. At least, that was the plan they started the day with. Unfortunately, the situation changed unexpectedly. 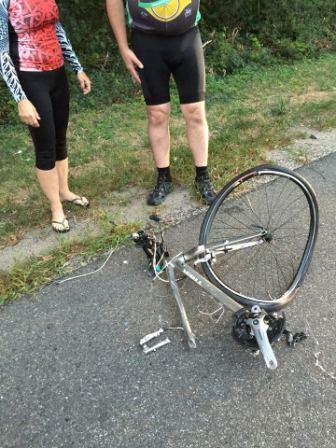 Dr. Chachkes’ bike did not survive the trip to the starting line. The bike fell onto I-295 while the team was driving to the event. Neither Dr. Coudrai’s skill for orthopedic surgery nor Dr. Hinze’s talents as a Certified Veterinary Acupuncturist would be able to cure the damage to this bike. It didn’t pull through. 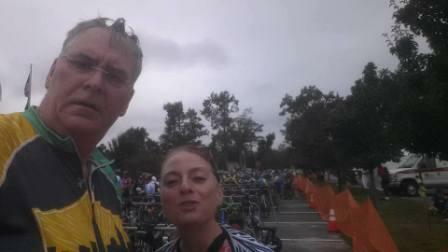 Dr. Chachkes’ plan for the day had to be changed since she did not have a bike to ride for the event. Instead, she went home to spend time with her family and celebrate her young daughter’s birthday. 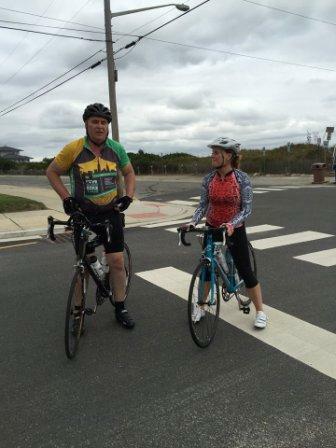 Dr. Philippe Coudrai and Dr. Amy Hinze were able to continue on and ride the distance. 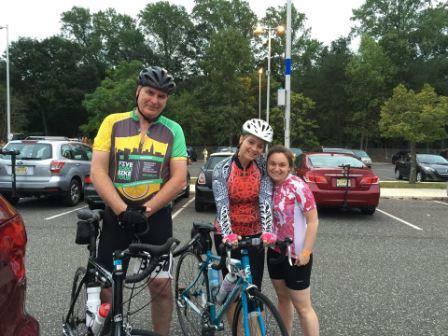 They began at 6:30am for their 80 mile ride. After the first 20 miles, they were feeling pretty good! They had had their warm-up and were making great progress. Dr. Coudrai documented their journey to the shore several times during the day. Another 11 miles marked the time to check their bikes for maintenance. It’s important to have the ideal tire pressure for such a long bike ride! 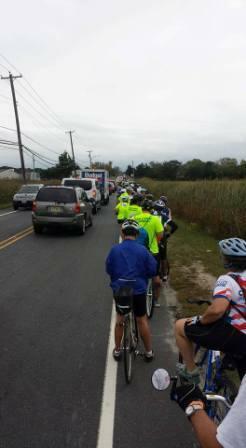 After the stop for air in Hammonton, they continued along their trek to Ocean City, New Jersey. By the time the duo were ready for their next break, they had put another 15 miles behind them. The sky was gray and spritzing with rain here and there, though thankfully there was not a heavy rain. Dr. Coudrai and Dr. Hinze worked very hard to be a part of the fundraiser to create a world free of MS. The whole Winslow Animal Hospital team is proud of their commitment and perseverance. 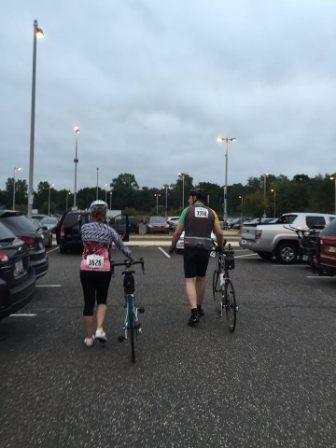 After a couple more stops and many more miles, Dr. Coudrai snapped this photo of the pair. 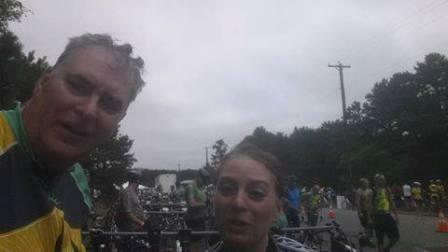 By this time, they had biked for 67 miles!! 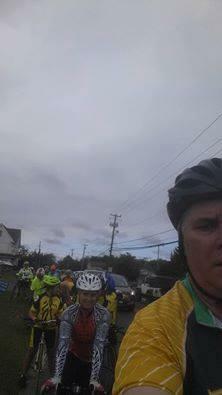 They had made it most of the way to Ocean City alongside others committed to the cause. Dr. Coudrai uploaded those photos so our followers on facebook could enjoy those photos in real time throughout the day. 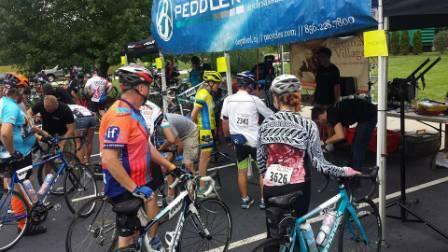 There were a large number of participants in the MS City to Shore Bike Ride. They rode carefully in a long line alongside the road in this photo. And Dr. Philippe Coudrai managed to capture this awesome shot! 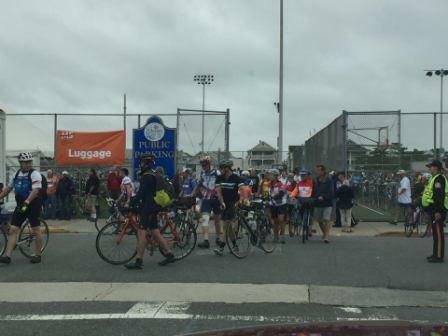 Thousands of bikers completed their journey to Ocean City, New Jersey and celebrated their accomplishments together. They made it! Congratulations, Dr. Philippe Coudrai and Dr. Amy Hinze! Your hard work and dedication are inspiring to the rest of the Winslow Animal Hospital family. Your efforts have contributed to the goal of making a world in which no one has to suffer with Multiple Sclerosis.